Powers/Abilities: Garrington is a skilled warrior, swordsman, and horseman. For several years his body was possessed by the spirit of his descendent Dane Whitman, who intermittently usurped control over his body. At times he wielded the Ebony Blade, able to cut through virtually any substance, as well as disrupt most forms of energy, including magical. He sometimes rode upon the magical steed Valinor, who, under some circumstances, possessed wings and could fly, and he briefly used the Evil Eye. (Real world history, per the Wikipedia) - In 1187 A.D., Saladin captured Jerusalem. Pope Gregory VIII preached the Third Crusade <to recover Jerusalem>, which was led by several of Europe's most important leaders: Richard I of England (who became king in 1189 A.D.), Phillip II of France, and Frederick I, Holy Roman Emperor. (Black Knight: Exodus (fb)) - Eobar Garrington was a knighted and charged with banishing the Moors from the holy land in the name of Christianity. (Black Knight: Exodus (fb)) - Garrington and his fellow knights set forth on arduous overland trek toward occupied Jerusalem. Although beset with rampant resistance on all fronts, it was only a matter of time before even Allah's holy soldiers fell before the Knight's so-called "righteous" wrath. (Defenders I#11 (fb) - BTS) - The spirit of Mordred the Evil arrived in the midst of the Crusades, affecting events so that King Richard was captured by the Muslims. Mordred also allied himself with Richard's brother, Prince John, who commanded a plan to desert the king. Mordred was aided by Chandu the Wizard, who was served by Temax and several other earth spirits. (Defenders I#11 (fb) - BTS) - After the body of Dane Whitman, the Black Knight of the modern era, had been turned to stone (see Black Knight statue), a spell of Merlin's summoned Whitman's spirit through time to oppose Mordred's plot. Whitman's spirit possessed and took control of Garrington's body in Cyprus. (Defenders I#11) - Dr. Strange, seeking a cure for Whitman's plight, was pulled back to the Crusades alongside the Defenders (Hawkeye, Hulk, Namor, Silver Surfer, Valkyrie (Brunnhilde)) to assist the Black Knight. The Knight quickly explained the situation to the Defenders, who returned the Black Knight to them, but he was overpowered along with several others by the powerful earth spirits. 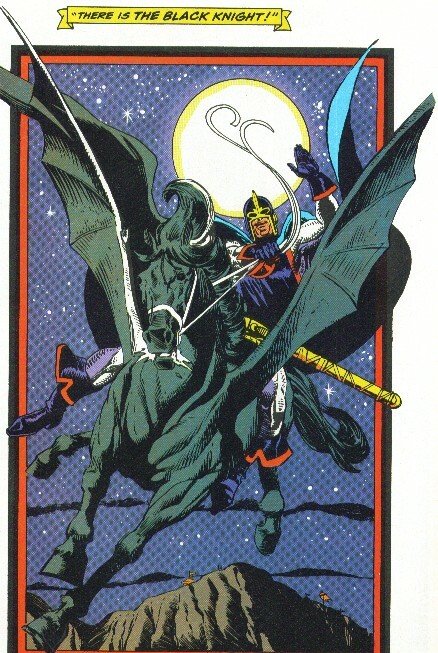 Namor defeated both Chandu and the earth spirits, and Prester John arrived in time to prevent Mordred and Prince John from accessing the power of the Evil Eye; Prester John defeated them with the Eye and then offered to send the Black Knight and the Defenders back to their time period, but Whitman elected to remain in the 12th century. (Official Handbook of the Marvel Universe Deluxe Edition#2 - Black Knight entry) - Whitman in the body of Eobar Garrington defeated Mordred and his allies Chandu and Prine John. (history/Marvel Fanfare I#52) <June 1191> - After conquering Cyprus, Richard sailed his armies, including the Black Knight (Garrington controlled by Whitman) to the Jerusalem. (Avengers I#264 (fb)) - In Garrington's body, Whitman's spirit fought savagely in the Crusades. (Marvel Fanfare I#52) - The Black Knight's fighting prowess quickly earned him respect among Christians and Moslem. (Marvel Fanfare I#52) - The Black Knight commanded the cavalry that broke the strategic city of Acre. (History/Marvel Fanfare I#52) <July 12, 1191> - At the conclusion of the fighting, the Black Knight ordered the Crusaders to treat the survivors or to grant them a swift death if they were beyond aid. Suddenly Al-Adil, brother of Saladin, rose from the fallen bodies and fled, unseating a Crusader and stealing his horse in the process. The Black Knight tracked and confronted Al-Adil, but their fight was interrupted by the People of the Hills, who captured them and took them for sacrifice to Moloch, the God of the Hill. The Knight broke free too late to save a sacrificial woman, but joined Al-Adil in battling the powerful creature. The Knight led al-Adil to douse Moloch in oil, escape his chamber, and then set fire to the monster. As the cavern collapsed, the Black Knight and Al-Adil agreed to part peacefully. (Marvel Fanfare I#53) - While defeating a group of Saracen, the Knight attracted the attention of Hassan ibn Sabbah, the Lord of Assassins known as the Old Man of the Mountain, who plotted against him. The Knight was summoned by King Richard, briefly meeting King Phillip II of France, Leopold of Austria, and Conrad of Montferrat. Richard told the Knight that he had not the supplies to feed their own troops and that he would need to execute the Muslim prisoners. The Knight sought an alternative to this slaughter, and Richard sent him to take a message to Saladin that he would surrender the troops if Saladin surrendered his fragments of the True Cross. Magically observing this, Sabbah sent his agent Karna to intercept the Knight to prevent him from ending the war, and to bring him to Sabbah to enslave, and so the sorcerer could study his sword. The Knight met up with and overpowered al-Adil and his troops, convincing them of his diplomatic mission, at which point they were attacked by Karna, who feigned severe injury when struck by an arrow, then kissed the Knight, sapping his energy and incapacitating them. Karna fought off al-Adil and his men, then took the Knight atop her mystic steed Valinor and brought him to Sabbah. Sabbah attempted to sway the Knight to his side, showing him images of King Richard buckling under pressure from Phillip, Leopold, and Conrad, giving the order to burn their prisoners. The Knight attacked Sabbah, but was overpowered, and then Karna kissed him, draining his life further. He seemed to surrender to Karna, but then rallied, pulled free from her, and shook off the illusions that Sabbah had placed before him. Sabbah formed a magical sword of flame to oppose the Knight, but was outfought and skewered by the Ebony Blade. The Knight then stole Valinor and returned to King Richards' camp, hoping to stop him from executing the prisoners. (history/Marvel Fanfare I#53) <August 20, 1191> - Arriving the next dawn, the Black Knight was too late to save the 2700 prisoners, who were burned to death. Furious with Richard for breaking faith with him, the Knight swore to make him pay. (Marvel Fanfare I#54) - The Knight burst into Richard's tent, threatening his life, but when Richard bared his chest, offering to allow the Knight to slay him, Whitman realized that he could not go through with it, especially since it would alter the course of history. As the Black Knight fled, an irate Phillip broke away from the Crusade, taking his troops with him. Sabbah, secretly allied with Conrad, cast a spell causing Richard to take ill, granting Conrad command. Sabbah then sent a group of his enslaved assassins after Richard. The the Black Knight flew away atop Valinor, he encountered the young Prester John fighting off five Saracen, and joined him in defeating his attackers. Realizing where John's destiny lay, the Knight agreed to take him back to the Crusaders' camp, arriving just as the assassins assaulted Richard. Even weakened, King Richard helped fight off the assassins, and they were defeated by Prester John and the Black Knight, though it was Conrad himself who slew the last of them, not wishing his actions to be publicly revealed. One of the assassins, clinging to life, summoned Sabbah, who took the form of a magical fire elemental and attacked the Crusaders. Just as Sabbah prepared to slay Conrad for his treachery, the Knight used his Ebony Blade, anointed with holy water by Prester John, to destroy Sabbah's conjuration. Conrad fled, while Richard began to recover from Sabbah's magical ailment. Grateful for the Knight's defense, he granted him true knighthood. However, for his treasonous assassination attempt, Richard banished him from his sight and forbade any scholar from recording mention of his name or deeds. Richard told him that he had followed the dictates of his conscience, not the dictates of his king, which no king could ever tolerate: Should the Black Knight ever return to England he would be put to death (see comments). (Marvel Comics Presents#73/4 (fb)) <1191> - Though still possessed by Whitman, Garrington regained control of his own mind, trading mental dominance back and forth between the two over the years. (Marvel Comics Presents#73/4) <1191> - After leading an army of Crusaders in a bloody battle, Garrington was summoned to the side of King Richard, who lay deathly ill. Richard commanded him to slay Saladin, to prevent the assassins of the Syrian Rashid ad-Din from slaying Saladin first and claiming his troops as his own. Whitman's mind knew that Saladin had not been slain at that time, and that to kill him, would alter the course of history. Nonetheless, Garrington remained in control and tracked down Saladdin, overpowered his guards, and disarmed Saladin. Before he could act, Rashid ad-Din's assassins arrived, and Garrington and Saladin joined forces to defeat them. Garrington then turned on Saladin, preparing to slay him; however, at that time, Whitman was able to force Garrington to stand down and lower his sword. Saladin's guards then captured the Knight, holding him captive for several weeks before ransoming him back to the Crusaders. (Marvel Comics Presents#73/4) - Eobar spent the rest of his days amongst the Crusaders in shame (see comments). (Marvel Super-Heroes III#4/6 (fb)) - Within a wooded swamp, the Whitman-possessed and controlled Garrington battled the sorcerer Kalmari and his monstrous minions. Kalmari taunted him that the only way to slay him would be to kill him, and so the Knight skewered Kalmari with his Ebony Blade, slaying his mortal form. (Black Knight: Exodus (fb) - BTS) - In the aftermath of the siege of Jerusalem (? ), the wizened Fellahin (peasant(s)) whispered tales of an ancient tower of power beyond the reckoning of man. (Black Knight: Exodus (fb)) - Garrington accompanied his ally Bennett du Paris to the hinterlands of Palestine, where they sought out the tower in the domain of the mythic "eternal pharaoh" in Akkaba. (Black Knight: Exodus) - In the modern era, the Eternal Sersi attempted to return both herself and the Dane Whitman Black Knight from the Ultraverse to the modern era of Earth-616, but they were instead sent to the 12th century, where Whitman's spirit again possessed Garrington (who should have already been possessed by Whitman at this time...). There, with Whitman's mind submerged, Garrington still had a glimmer of recognition for Sersi, and saved her from the other Crusaders, earning the enmity of Paris in the process. Paris located the tomb of an avatar of Apocalypse, who trained him to access his mutant powers to become Exodus. As she led Garrington to Paris, Sersi told Garrington about Whitman being trapped inside of him. Seeing Sersi's bond to Whitman, Garrington allowed her to coax his own spirit from him, seemingly leading him to pass on to a higher plane. 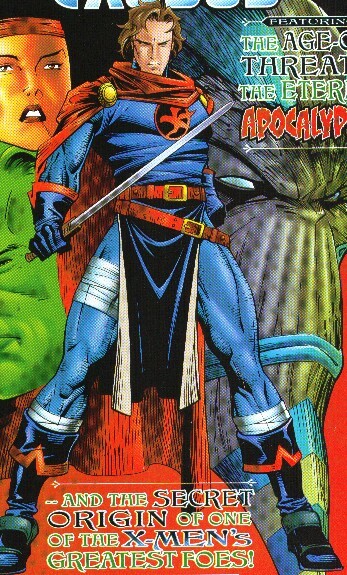 With Whitman now controlling Garrington's form again, he encountered Apocalypse, who forced Exodus to battle the Black Knight to prove his loyalty. Exodus overpowered both the Black Knight and Sersi, but when Apocalypse ordered Exodus' former ally's death, Paris refused and turned against Apocalypse. The eternal mutant easily overpowered Exodus, sending him into stasis and banishing him to a tomb at the base of the Swiss Alps. (Cable II#30 (fb) / Black Knight: Exodus) - The Whitman-possessed and controlled Garrington Black Knight led a group of Crusaders to a chamber in the Swiss Alps which held the inert form of Exodus. Two other Crusaders vowed to forever watch over and protect Paris/Exodus' inert form. (Avengers I#225 (fb) - BTS) - The Alchemists of Avalon fell, and Avalon came to mirror the appearance of the Dark Realm of the Fomor. Amergin, last of the Alchemist, sought out the aid of the Black Knight (Eobar Garrington possessed/controlled by the spirit of Dane Whitman), and through him learned of his future allies, the Avengers. Amergin contacted his own descendent, Dr. Druid, and arranged for him to serve as a conduit to send the Avengers to Avalon in his time. Amergin intended to use the legendary Evil Eye to drive off the Fomor forever, but he required the aid of the Avengers to siphon the power it needed from the monstrous Balor. (Avengers I#225) - Five years after the Black Knight had arrived in the 12th century, Druid succeeded and the Avengers (Captain America, Hawkeye, She-Hulk, Thor, Wasp) arrived in Avalon. The Black Knight convinced them to join with Amergin, but they were suddenly ambushed by the Fomor (Bres, Cethlann, Dulb, Elathan, Tethra). As the Avengers fought the Fomor, Bres targeted Amergin. The Black Knight wounded him with the Ebony Blade, but Bres flattened the Knight with a single blow, allowing him to assault Amergin, overwhelm him, and use his connection to Dr. Druid to travel forward in time to the modern era. The Fomorian Cethlann then summoned Balor to the fight, and the monstrous creature neutralized the magics holding the She-Hulk and Thor in the past, though it appeared to the others that they had been destroyed. (Avengers I#226) - Against Amergin's wishes, the Black Knight saddled up Valinor and joined the fight against Balor, allowing the Avengers to escape his attack. When the Fomor attacked anew, Amergin confronted them with the Evil Eye, using it to siphon Balor's power, while the Black Knight led the Avengers against the other Fomor. Elathan disrupted the siphoning of Balor's power and nearly slew Amergin, but the Knight turned back Elathan's assault via the Ebony Blade. Balor was destroyed attempting to regain his power from the Eye, and the dying Amergin told the Black Knight how he could use the Eye to seal off Avalon from the Fomor. However, as the Eye had been overloaded by absorbing Balor's full power, using the Eye would prove fatal to whoever did so. Accepting the risk, the Knight returned the Avengers to their own era, sealed Avalon, and apparently destroyed the Fomor as well. The body of Eobar Garrington was left a lifeless skeleton, while the spirit of the Black Knight was sent back to the modern era, where, via the magic of Amergin, it was restored his body, which in turn was restored from its broken and petrified form. Comments: Created by Steve Englehart, Sal Buscema, and Brank Bolle. Sorry if the dialogue is rough, but I tried to clarify that we were talking about the Black Knight, but also to tell whether it was Whitman or Garrington in charge. 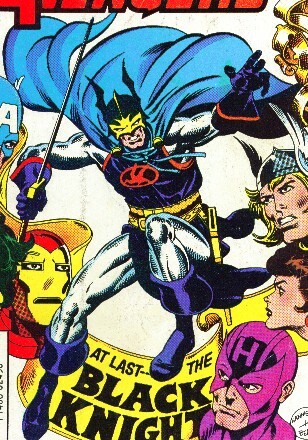 As far as I can tell, the name Eobar Garrington was first given in the Official Handbook of the Marvel Universe Deluxe Edition#2: Black Knight entry. Very little is actually known of Eobar Garrington. Only in the flashback in Marvel Comics Presents#73 and Black Knight: Exodus do we see him acting while not under the control of Dane Whitman, and only in Black Knight: Exodus do we see him unmasked. While it's not clearly stated, the Black Knight apparently arrived in the Crusades in 1191 during the battle in Cyprus, and was only active in the Crusades for a year or so, as Saladin and Richard made a truce in 1192. The other 3+ years must have been in other adventures, and it is not known exactly at what point he went to Avalon. The story in Defenders I#11 made it appear as if Merlin's spell had created a body for Whitman in the 12th century, rather than usurping the form of his ancestor. It seemed to show King Richard dying in 1191, when we know that that Richard didn't die until 1199. Still, it wasn't confirmed that he died in that story, it just appeared that way. So, we'll go with the fact that Richard did NOT die in this story. It had Garrington serving King Richard, which would make it appear to precede the Marvel Fanfare stories, but then it had him falling into shame for the remainder of his life, when he was still in glory in the Marvel Fanfare stories, which would make it seem to come after them. If Marvel Comics Presents#73 came first, as the Marvel Chronology Project states, then he had to overcome his shame and regain his standing with King Richard. If Marvel Fanfare#52-54 came first, then King Richard had to welcome him back into service after a near-assassination attempt. Perhaps he recognized the need for the Knight's abilities and decided to overlook their conflict. Marvel Fanfare specifically states that the Knight had not spoke to Richard since the events of Defenders I#11, and the story events follow pretty much directly from the story in Defenders#11, so I'm voting that Marvel Fanfare came first. The chronology is pretty hard to figure out, as few stories reference any others, but let me know if you have any good reasons why the order should be different. The Crusades began in 1096 AD, lasted about 200 years, and focused on wars over the Holy City - Jerusalem. The Crusade that Eobar and Dane were involved with was the Third Crusade. Fellahin is the plural of Fellah, which means: A peasant or agricultural laborer in an Arab country, such as Syria or Egypt. Both Rashid ad-Din from MCP#73 and Hassan ibn Sabbah are referenced as the Old Man of the Mountain and the Lord of Assassins. Whether they were the same man, or whether they were just mistaken for one another is unclear. Hassan ibn Sabbah? The founder of the Hashishin? Who died in 1124, significantly before King Richard's crusades??? As for Rashid ad-Din, he actually was active at that time (died 1192), and was the leader of the Hashishin. "Old Man of the Mountain" simply refers to the name of the Hashishin's leader at that time (of course, the modern day leader of the Hashishin is Fu Manchu). Any chance that the Marvel Fanfare story takes place in an entirely different time period? Marvel Fanfare is specifically dated as 1191, and fits into historical dates of events (victory at Acre, slaughter of the prisoners), and is supposed to pretty much directly follow Defenders#11. Rashid is not seen in MCP, but there is no hint that he is anything more than a normal man. Hassan, however, is a sorcerer and possibly not even human. Perhaps he took human form, which died, or appeared to do so, in 1124. That's not a problem, as the Knight stabbed him through the chest with the Ebony Blade, but he was only faking injury and got up, none the worse for wear, minutes later. So Hassan would seem to have been the founder, as well as a supernatural being, while Rashid just succeeded him as leader of the Earthly sect. Savage Sword of Conan#188 shows that Conan is partially to blame for the Crusades. When he fought a priestess of Yog (demon worshipped in Darfar) the priestess' blood fell to the ground, cursing it. That ground was in the land that became Palestine. Thanks to Per Degaton for pointing out the adventure Garrington's additional fight with Mordred and his allies. The info came from the Official Handbook of the Marvel Universe Deluxe Edition#2 and the Avengers Index#6.